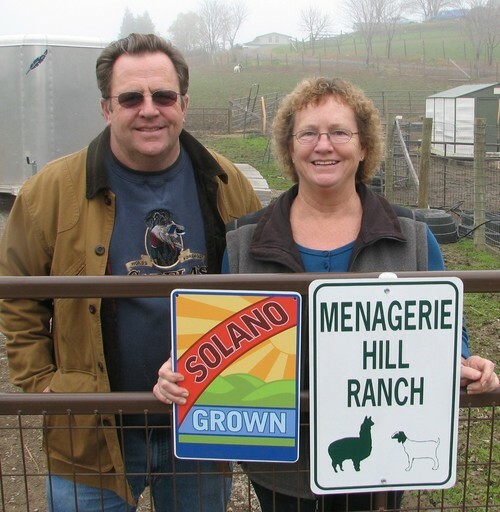 Menagerie Hill Ranch is An Alpaca Farm located in Vacaville, California owned by Deb Galway & Kirk Howard. Enjoy a Visit to the Ranch! Welcome to Menagerie Hill Ranch! We hope you enjoy visiting our website. Please take a look at our sales lists and enjoy learning more about our farm. We also encourage fans to come visit the alpacas in person or shop the farm store. Visits (store or tour) are BY APPOINTMENT. Please CALL AHEAD to make sure we are available. Note that we charge $20/person for tours. Join us in welcoming our newest herdsire RR Guns Kit Carson, a 17X Champion with many champion cria on the ground! Together with LV Silver Samovar by Vantaggio (recently took Reserve Color Champion in gray at the California Classic! ), we have some very fine fleeced boys that we hope will add some great grey and black genetics to our herd! 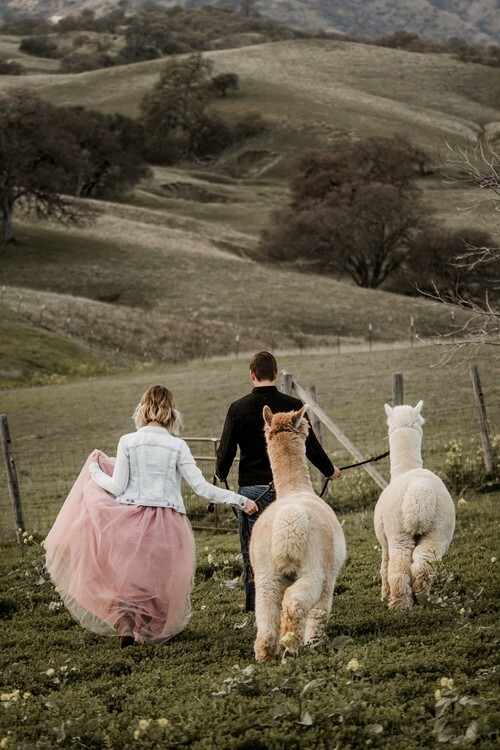 Check out our blog (home schooler's farm visit report) and photo gallery with pictures of several off-site weddings/events featuring our alpacas. RR Guns Kit Carson, 17X Champion! 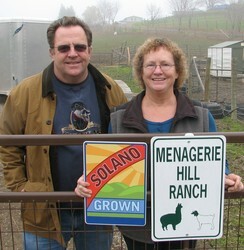 Menagerie Hill Ranch is a full service Northern California Alpaca Ranch. We are located in the English Hills area of Vacaville, CA. Being midway between Sacramento and the San Francisco Bay Area, we are less than an hour from either location. Our property abuts the 3,000 acre Timm Ranch that spans the area between Vacaville & Winters. The views are amazing! Directions can be found on the More Info/Visit Us page. After many years with a large variety of species, our kids are grown and just about gone. So we've been able to reduce our menagerie. Over the years, we've found the Alpacas & Llamas to be the easiest and least expensive to raise and care for. And we so love their easy going nature and fiber! So, we've focused on breeding alpacas for sale as breed stock and for fiber. In breeding alpacas, our focus is on continuous improvement in fiber quality, while maintaining excellent health and conformation, and an easy going personality. Most of our alpacas are colored and we've been fortunate to produce quite a few gorgeous blacks and grays. Services available include: agisting/boarding, breeding, ranch consulting, ranch tours, start-up training and more. Check out our Store Page for more information about items we have for sale, including a full range of alpaca fleece products and novelties. Note that our inventory is constantly changing and we often have items in the Farm Store that haven't made it to the website yet. We are always happy to help our customers and visitors. If you don’t see what you are looking for, please ask. We can help you find it. Financing is available on all alpaca sales. We can work with your budget. We ask for 25% down, no interest if paid in full within one year of purchase. 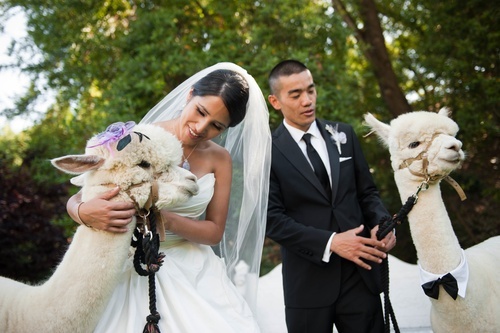 Purchaser will provide alpaca insurance on each animal until paid in full. Breeding/Show quality maidens come with a free breeding to any Menagerie Hill Ranch owned unrestricted Herdsire. 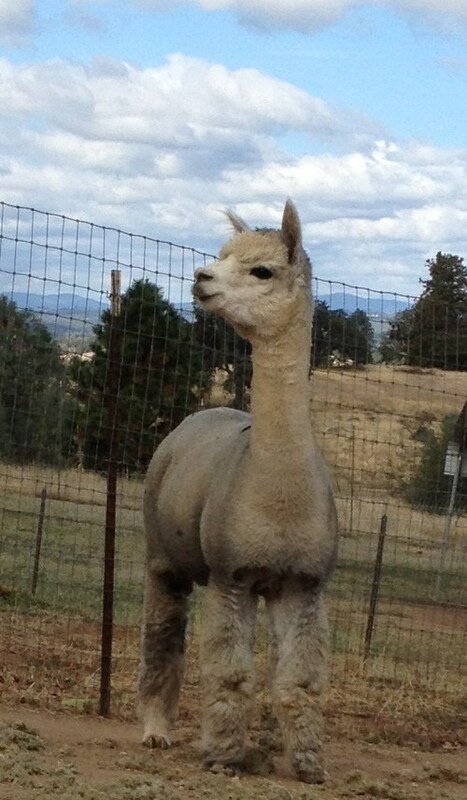 Agisting (boarding) available - 30 days included with in State purchase of breeding quality alpaca. 90 days included for out of state purchases. Purchaser assumes all Vet fees. Transport available - first 100 miles included with purchase of breeding/show quality alpaca.